Hoist Sail for the Heliopause and Home was created for the @party demoscene event in Massachusetts, in the summer of 2010. Like all of my short works, apparently, it took a month to write. 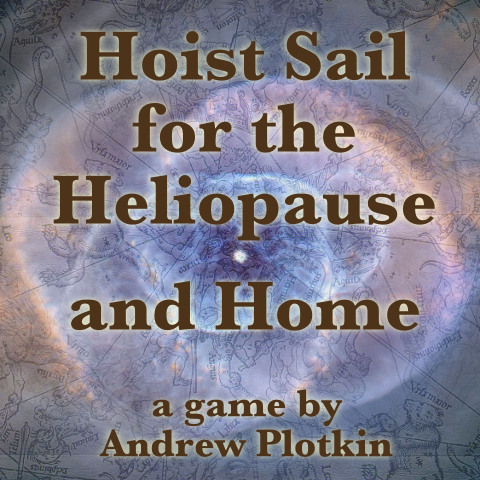 Hoist Sail for the Heliopause and Home is copyright 2010 by Andrew Plotkin (erkyrath@eblong.com). It may be distributed for free, but not sold or included in any for-profit collection without written permission from the author. I presented this game as a work-in-progress at the Grue Street IF writer's workshop; the feedback was invaluable. Beta playthroughs were offered by Emily Short, Dan Efran, Jake Eakle, Kevin Jackson-Mead, and Sarah Morayati. My thanks to them and to everyone who helped out. The cover art is a composition of the Cat's Eye Nebula (NASA, ESA, HEIC, and The Hubble Heritage Team (STScI/AURA), 2007) and a Celestial Map of the Northern Sky (Albrecht Dürer, 1515).